Following the conclusion of the 2019 IIHF World Junior Championship in Vancouver and Victoria, British Columbia, the groups have been established for the 2020 tournament set to be played in Ostrava and Trinec, Czech Republic. Due to its silver-medal finish, the United States will skate in Group B, which will play its games at Ostravar Arena in Ostrava. Team USA's opponents will include Russia (bronze in 2019), Canada (sixth in 2019), host Czech Republic (seventh in 2019) and Germany (promoted from Division I). The 2019 IIHF World Junior Championship marked the first time since 2005 that the U.S. and Canada did not meet in an IIHF World Junior Championship. Team USA will enter its meeting with a four-game win streak against the Canadians and an overall record of 8-3-3-29-3 (W-OTW-OTL-L-T). Last Meeting: The last time the two teams met, history was made as the U.S. and Canada met outdoors at New Era Field for the first-ever outdoor game in IIHF history. In front of a record 44,592 fans, the U.S. stormed back from a 3-1 deficit to edge Canada, 4-3, in a shootout. The U.S. wore a special Bills-replica jersey that utilized jersey numbers on the front and back, similar to an NFL jersey, with colors similar to the NFL's Buffalo Bills. The 2020 tournament will mark the third-straight year the U.S. and Czech Republic will face off in tournament play. Not since the 2014 IIHF World Junior Championship have the two teams met in the preliminary-round. Four of their last five meetings -- all U.S. wins -- have come in the playoff round (three quarterfinals, one bronze-medal game). Last Meeting: On Jan. 2, 2019, the United States skated to a 3-1 victory over the Czechs in Victoria, British Columbia. The win extended Team USA's record over the Czechs to 13-1-1-7-1 (W-OTW-OTL-L) in tournament play and gave the U.S. its fifth-straight win over the Czechs. Germany returns to the top division of the IIHF World Junior Championship for the first time since the 2015 IIHF World Junior Championship. The 2020 tournament will mark the 12th meeting between the two teams. The U.S. holds a 10-0-1-0-0 (W-OTW-OTL-L-T) record against the Germans, including four straight shutout wins. Last Meeting: The last time Germany was in the top division, the two teams faced off where the U.S. skated to a 6-0 win on Dec. 28, 2014. The 2020 tournament will be the sixth-straight year the two teams are meeting and the second time in the last three years they will do so in the preliminary round. All-time, the U.S. holds a 7-1-0-12-0 (W-OTW-OTL-L-T) record against the Russians, but has won its last four meetings all by one-goal games. 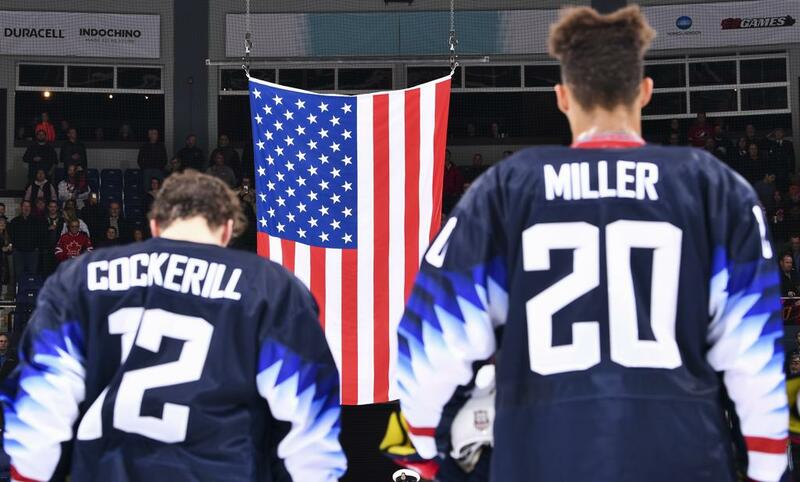 Last Meeting: On Jan. 4, 2019, the U.S. skated to a hard-fought 2-1 semifinal victory to earn a berth in the gold-medal game. The victory was Team USA's fourth-straight over Russia and third-straight in playoff round action.